Suspected armed Fulani herdsmen on New Year’s eve stormed the rice farm belonging to Benue State Governor, Samuel Ortom, and set it ablaze. The rice farm, located in Gbajimba in the Guma Local Government Area of the state, was said to have been razed down by the suspected herdsmen. 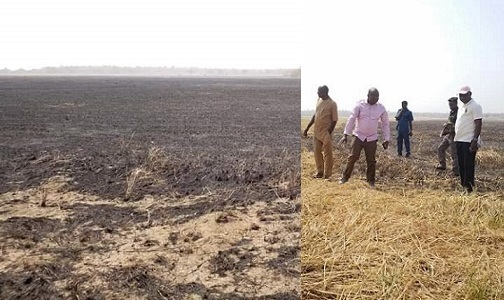 The rice farm, according to the Farm Manager, Kena Iordzua, covered about 250 hectares of land, with the burnt rice estimated at over N100m. The farm manager told our correspondent that the herders came to the farm with a large number of cattle during the day and set it on fire at three different points. Iordzua said the inferno could not be put out due to the wild nature of the fire as a result of the harmattan. The farm manager added that security agents were mobilised to go after the herdsmen, who shot sporadically in the air as they retreated towards the Nasarawa State border. He said, “The burnt portion of this rice farm is estimated to be 250 hectares and was worth well over N100m. The Principal Special Assistant to the Governor on Special Duties, Abrahams Kwaghngu, described the action of the herdsmen as barbaric and a threat to food security. He stated that the law prohibiting open grazing of cattle was still in force in the state and should be obeyed by all, stressing that the Federal Government needed to act fast to stop impunity by the herders. Kwaghngu lamented that after displacing the people from their ancestral homes for over a year, the herdsmen would not allow the little crops that had been cultivated to be harvested.